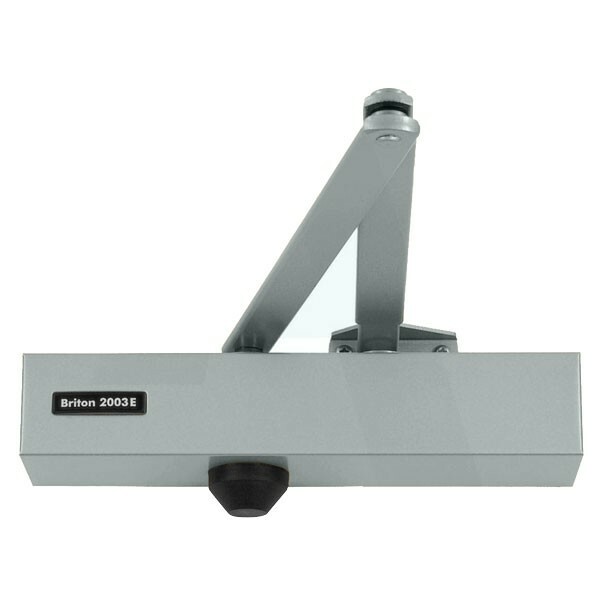 The Briton 2003 series door closer is the UK’s number one selling overhead door closer. It is typically fitted in offices, school, hospitals and all manner of commercial properties. Briton is a name that combines every aspect of excellence in door controls, and as part of a continuing programme provides products to the highest standard. When the situation of use and the door size and weight is known, fixed strength closers like the Briton 2003 provide an economic solution. With little on-site adjustment needed, installation is quick and trouble-free. The Briton 2003 has a fixed closing power of EN size 3 (maximum door width 950mm and weight 60kg). The latest Briton 2003 series closer has been developed specifically to meet and exceed the exacting requirements of the European standards, BS EN 1154: 1997 for door controls. 10 Years manufacturers warranty. Supplied complete with full fitting instructions.